English paper piecing is a great way to add interesting elements to a quilt or sewing project. 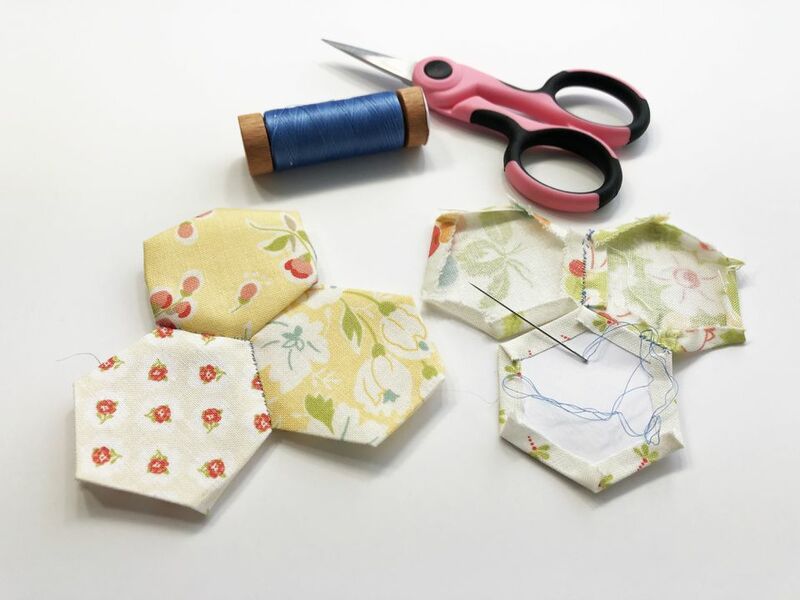 Unlike traditional patchwork piecing, you can use paper templates to help you get shapes like hexagons, triangles, and diamonds. Also called EPP, English Paper Piecing is easy to learn and is more forgiving than traditional piecing because you don't need to worry so much about consistent seam allowances. By using the paper templates you'll get a precise shape that will fit perfectly into your design. You'll need a template for English paper piecing, and you'll use it in two ways: to cut your fabric and to baste to your fabric so you can attach the pieces together. Sometimes acrylic templates are used for cutting the fabric and then the paper templates are used for basting. It's also okay to use the paper template for cutting as I've done here. These templates come in all different shapes and sizes. Hexagon (like used in this tutorial), is the most popular shape but there are also diamonds, wedges, circles, clamshells, triangles, and more. In this tutorial, I'll be using a 1" hexagon paper template courtesy of Love Patchwork & Quilting, but you can use any size you'd like. Print off the paper templates and carefully cut around as many templates as you'd like to use. Use one of the paper templates to cut your fabric by placing the paper template on the wrong side of the fabric. Secure with a glue stick or sewing pins. Leave a 1/4-inch seam allowance around the template before cutting. Continue cutting your fabric until you get the number of hexagons you like. Before you baste your fabric around the paper template, you'll need to attach it first. You can use a sewing pin or small amount of glue from a glue stick do this. Fold the fabric inside along the sides of the hexagon. Finger press them to make a crease. You'll now need to baste your fabric pieces to the paper piece. You can do this with a glue stick or with a needle and thread. Glue basting is a really easy way to English paper piece. Just dab a little bit of a glue stick to the edges of the paper template and then fold the fabric over and finger press to secure. Another way to baste in English paper piecing is to use a threaded needle and backstitch to secure the fabric edges down. These are temporary stitches so you don't need to be perfect with them. Beginning on a folded corner, go from right to left, pushing the needle through both flaps of the fabric. Be sure not to stitch through the paper. Repeat this stitch again, in the same place. Move the next corner and make another backstitch, just as you did before. Work your way all around the hexagon continuing to backstitch the corners. When you're finished knot off your thread. Place two hexagons right side together. Start at one corner with your needle and thread and whipstitch them together. Be sure not to catch the paper template when you're stitching. Stop and knot your thread when you reach the end. No need to cut the thread if you're attaching another hexagon to the edge that you are going to stitch next. I've used a contrasting thread here so you can see the stitches better. Be sure to use a matching thread so the stitches blend in with your fabric. Keep attaching the hexagons together using the whip stitch. When you've attached them all, give it a gentle press with a dry iron. Remove the paper templates by gently pulling them out of the hexagons. If you have trouble, try folding the paper and removing it or using a tip of a pencil to lift the templates out. Give your English paper piecing project a nice press with your iron. Remove any basting stitches that are visible. Now you can add these lovely shapes to any of your projects to have an eye-catching, contrasting texture, color, or fabric.